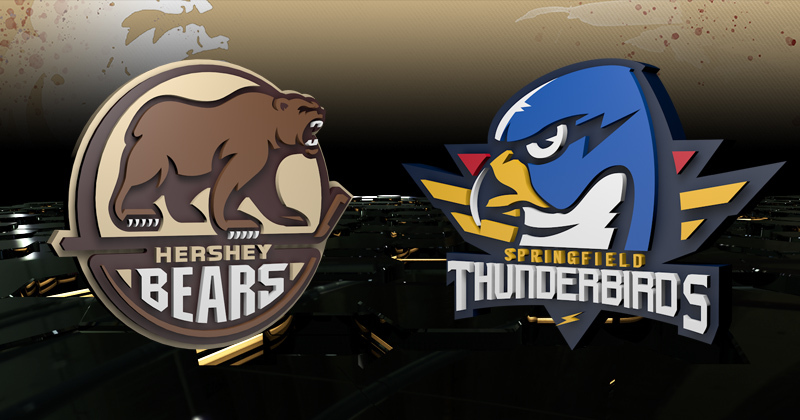 Game Preview: Bears at Thunderbirds, 7:05 p.m.
01/11/2019 - The Hershey Bears open the road portion to their 2019 schedule with a Friday night tilt against the Springfield Thunderbirds. The Bears and T-Birds have met three prior times this season with Springfield winning the last two games. RADIO: WQIC-100.1 FM, Fox Sports 1460-AM, Zack Fisch, the Voice of the Bears on the call. The Bears return to the ice this evening for the first time since last Sunday, a 3-1 loss on home ice to the Milwaukee Admirals. Hershey opened the scoring with a Nathan Walker goal at 15:26 of the first period, but the Admirals scored three straight times, including twice in the second period, to sweep the two-game season series with Hershey. The Bears allowed a season-low 18 shots in the loss. The Thunderbirds have also been out of action since last Sunday, a 4-3 overtime loss to Lehigh Valley. Sebastian Repo, Harry Zolnierczyk, and Josh Brown scored for the T-Birds, but Mark Friedman spoiled the contest for the 4,733 in attendance, striking for the overtime winner. Samuel Montembeault had 40 saves for Springfield. Tonight marks the fourth meeting between the Bears and Thunderbirds this season. Springfield has won the past two affairs, including claiming a 4-1 decision in the most recent meeting on Dec. 16 at the MassMutual Center. That contest marked Hershey’s first regulation loss at MassMutual Center since Mar. 8, 2008, and ended the Bears 15-game point streak in road games versus Springfield teams at 11-0-1-3. Anthony Greco has four goals in the four contests versus Hershey this season. Both teams enter tonight’s game looking to overcome recent struggles The Bears are 4-6-0-0 over the past 10 games, while Springfield is 3-4-3-0. Hershey forward Nathan Walker has been a bright spot in the three games versus Springfield this season. The fifth-year Hershey forward has three goals this season versus the T-Birds, the most of any Bear in head-to-head action. Since Springfield’s team was christened the Thunderbirds in 2016, Walker has played in 13 games versus the T-Birds, tallying eight points (seven goals, one assist). He enters tonight’s game with points in each of his past two contests, and 14 points (eight goals, six assists) in 21 AHL games this season. Hershey defender Aaron Ness continues to produce from the backend, posting assists in his past three games. The veteran has accumulated five points (one goal, four assists) in that span. He scored a goal and two assists in the win over Grand Rapids last Saturday, striking for a single-game high three points for the fourth time in his AHL career. Ness has points in four of his past five games, and has added to the score sheet in six of the past 10 games. Tonight’s game will mark the 100th career AHL game for forward Steve Whitney. He has collected 33 points (16 goals, 17 assists) in his 99 previous AHL games. Whitney has contributed six points with Hershey in 26 games this season as he returned to an AHL roster for the first time since the 2013-14 campaign when he was a member of the Norfolk Admirals. Tonight is Whitney’s first game in Springfield since Feb. 23, 2014, when he helped his Norfolk team to a 3-2 win over the Springfield Falcons. Tonight’s game features the two goaltenders selected to represent the Atlantic Division at the 2019 Lexus AHL All-Star Classic later this month in Springfield. Thunderbirds goaltender Samuel Montembeault earned an All-Star Classic nod in his home city, and ranks third in the AHL in saves with 628 and fifth in the league in minutes played at 1368:38. Hershey netminder Vitek Vanecek is 12th in the AHL with a 2.64 goals against average, earning him a spot in the All-Star Classic for the first time in his career. About the Hershey Bears: The Hershey Bears have been proud members of the American Hockey League since the 1938-39, making them the longest continuously operating member club of the league still playing in its original city. The Bears have won the Calder Cup 11 times, the most of an AHL franchise. Hershey has led the league in attendance in 11 of the past 12 seasons, drawing over 9,000 fans per game at the Giant Center. The Bears are the AHL affiliate of the 2018 Stanley Cup Champion Washington Capitals of the National Hockey League, and are affiliated with the South Carolina Stingrays of the ECHL. Visit www.HersheyBears.com and follow Hershey Bears on our social media channels for ongoing team and schedule updates. About Hershey Entertainment & Resorts: Hershey Entertainment & Resorts (HE&R) is a world-class entertainment and hospitality company dedicated to preserving the legacy of Milton S. Hershey. Founded in 1927 by Milton S. Hershey, HE&R and its subsidiaries own and/or operate the Hersheypark Entertainment Complex, Hersheypark Arena & Stadium, ZooAmerica North American Wildlife Park, Hershey Bears hockey team, Giant Center, The Hotel Hershey, Hershey Lodge, Hersheypark Camping Resort, The Spa At The Hotel Hershey, Hershey Country Club and Hershey Golf Collection, Hershey Nursery, and Hershey Laundry & Dry Cleaning. For additional information about HE&R, visit www.HersheyPA.com. Trademarks appearing in bold are owned or used by Hershey Entertainment & Resorts Company under license or with permission. All rights reserved. school in the world, as it continues to provide opportunities for children in need.